If you’re looking for gluten free places to eat in London, you’re in for a treat. The capital city is literally bursting with free from eateries. 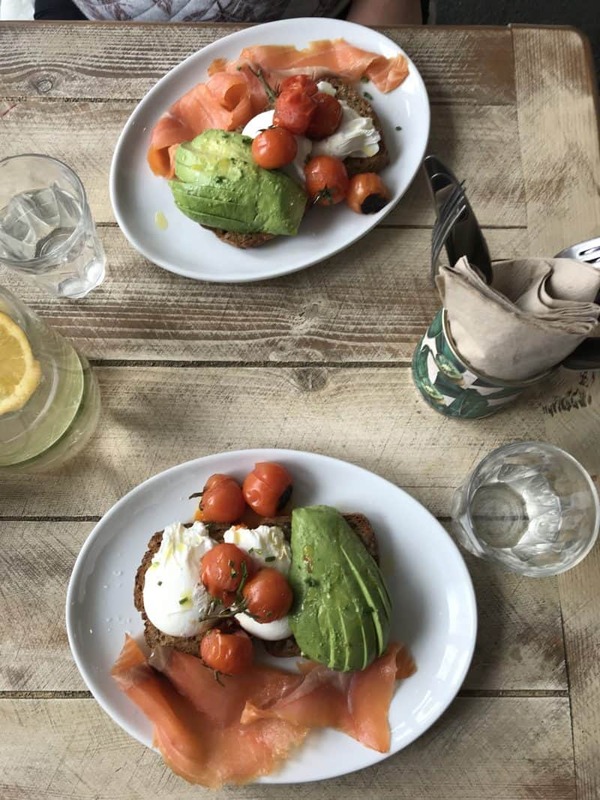 Whether you head to a chain restaurant, a food market or an independent cafe, you’re bound to find something gluten free. Living in Devon, I don’t get to visit London as often as I’d like. When I do, finding new gluten free places to eat in London is my number one favourite activity! 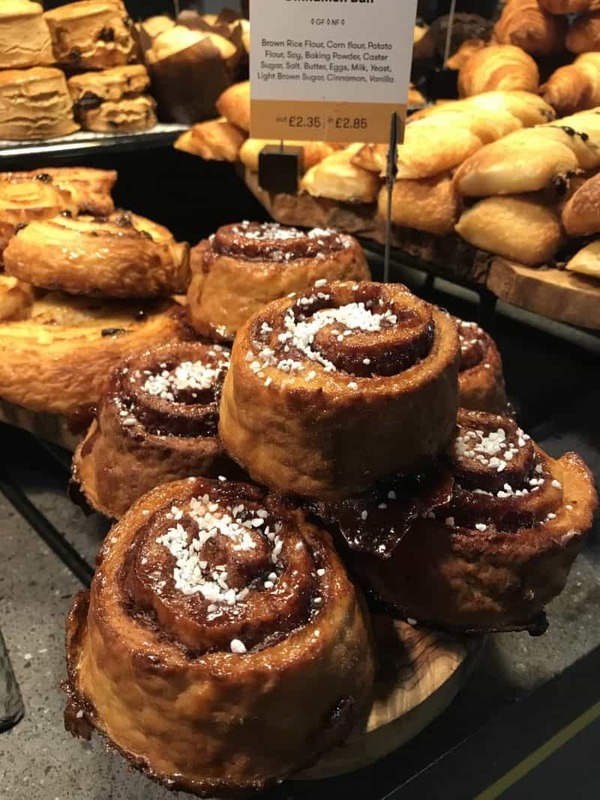 Here is my guide to 12 gluten free places (in no particular order) you HAVE to try if you’re visiting London. Beyond Bread is a truly magical place for coeliacs. Beyond Bread, in Charlotte Place, is a 100% gluten free bakery, brimming with all sorts of treats. From freshly-baked gluten free bread to flaky gluten free croissants, it’s such a strange, yet exhilarating, feeling to be able to walk into a bakery and eat EVERYTHING. My only regret was not spotting their brunch menu before I ordered – but this gluten free toaste with mozzarella and mushrooms was an absolute delight. Yorica is basically free from heaven. 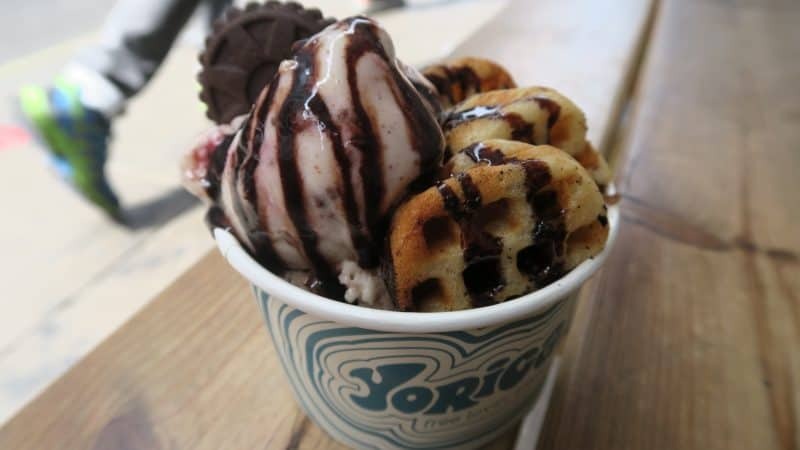 Situated in Soho, Yorica serves up free from ice-cream, in either tubs, cones or with gluten free waffles. They have a ridiculously awesome selection of gluten free and dairy free ice-creams, and an equally amazing amount of gluten free toppings. 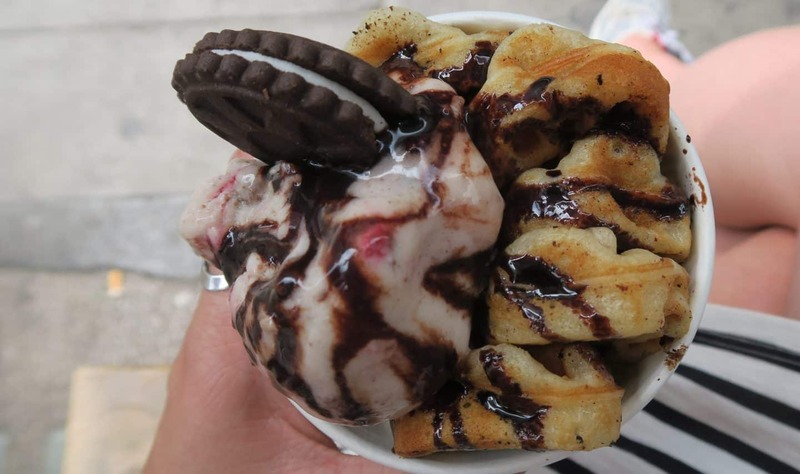 It’s amazing to go to an ice-cream parlour where there is no fear of cross-contamination! And while £8-odd might seem a lot for two scoops of ice-cream, the portions are so generous, it’s basically a meal. A must visit. Named after a phrase commonly found painted on taxis in India (apparently), I found Horn OK Please at Borough Market in London. I was absolutely full from all the other food I had eaten, but the tantalising smells of Indian street food just drew me in. Their food is vegetarian and can be made gluten free and/or vegan. I went for this dosa, a kind of lentil pancake, filled with spicy potatoes and with an amazing range of sides. If you want a bargain lunch which is DELICIOUS, come here. Leon is one of those places which Londoners probably take for granted as another chain. I, on the other hand, sit there wondering why the hell there aren’t more fast food options like this? 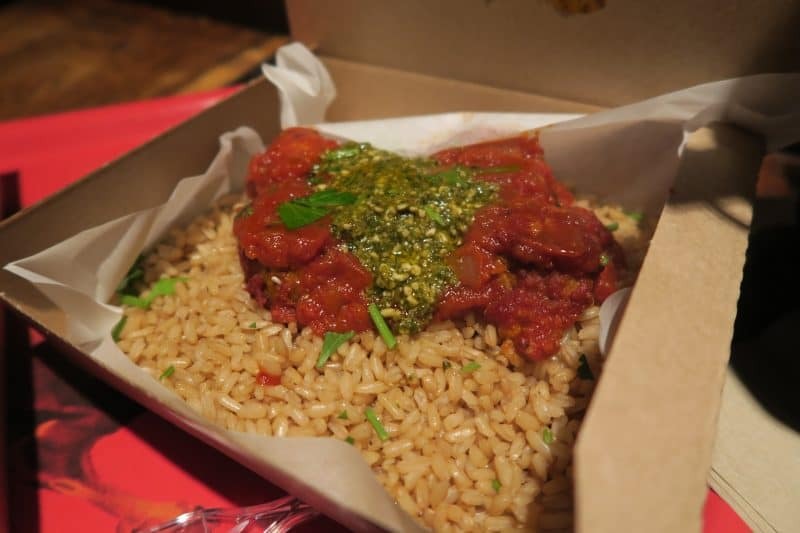 Packed with healthy, fast food, Leon always has loads of gluten free options. The chicken meatballs are my go-to, and the gluten free pecan pie is to die for. And it’s all clearly labelled for allergens. Win. 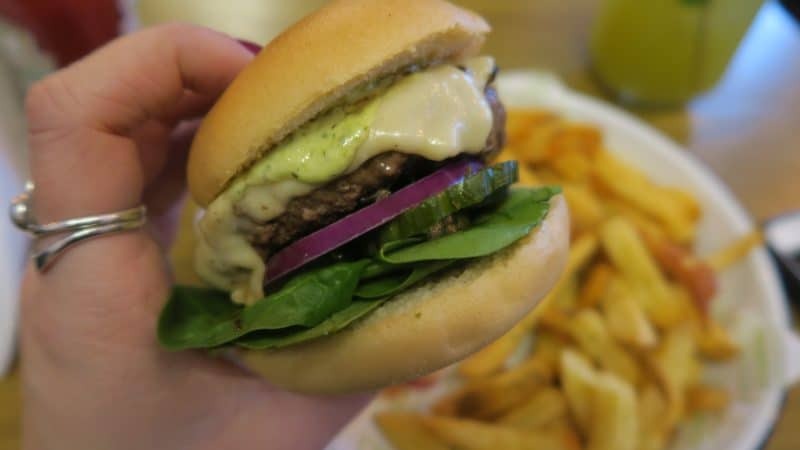 Honest Burgers just seems to keep growing – and it’s clear to see why. Honest Burgers’ gluten free offerings include gluten free burger buns, rosemary salted fries, and gluten free onion rings. Yes, that’s right: gluten free ONION RINGS. I love the fact they have a simple menu, made up of good-quality, low-fuss food, and great-sized portions. I try and visit whenever I visit London. 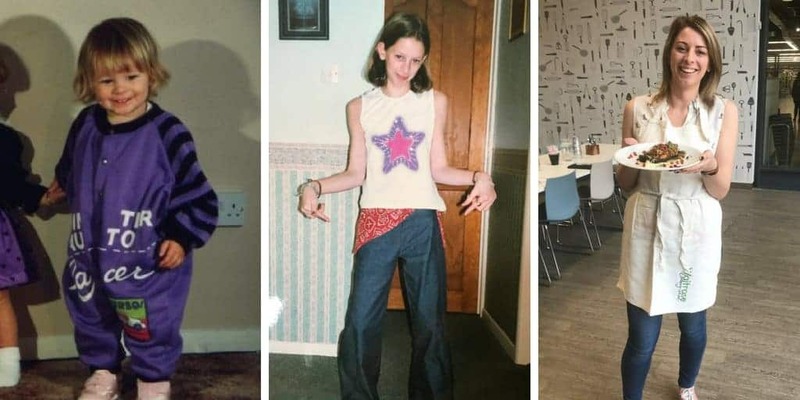 Now I’m not vegetarian, but The Gate in Hammersmith was the first restaurant that made me realise vegetarian meals are not something to be scoffed at. 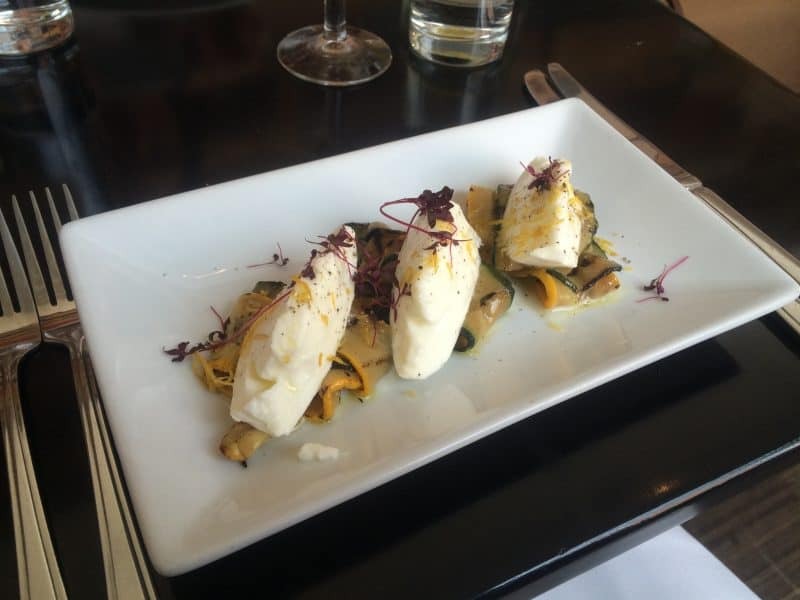 Set in a beautiful, glass-roofed restaurant close to Hammersmith Apollo, The Gate serves up incredible gluten free food. Their polenta fries are worth going for alone, and whether you’re vegetarian or not, it’s worth a try. Neal’s Yard is a hidden treasure in London. It is this super cool courtyard surrounded by great coffee shops with a ‘healthy’ vibe. Neal’s Yard has a completely raw menu, but one I found really interesting. 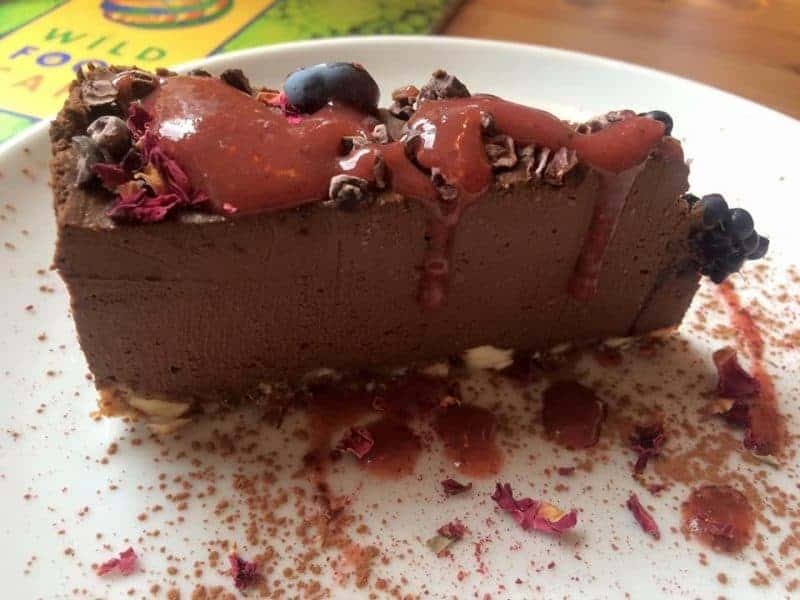 The majority of the food is gluten free – this raw cheesecake was lovely, and if you can get a window seat, it’s a great spot to sit and people watch over gluten free lunch. 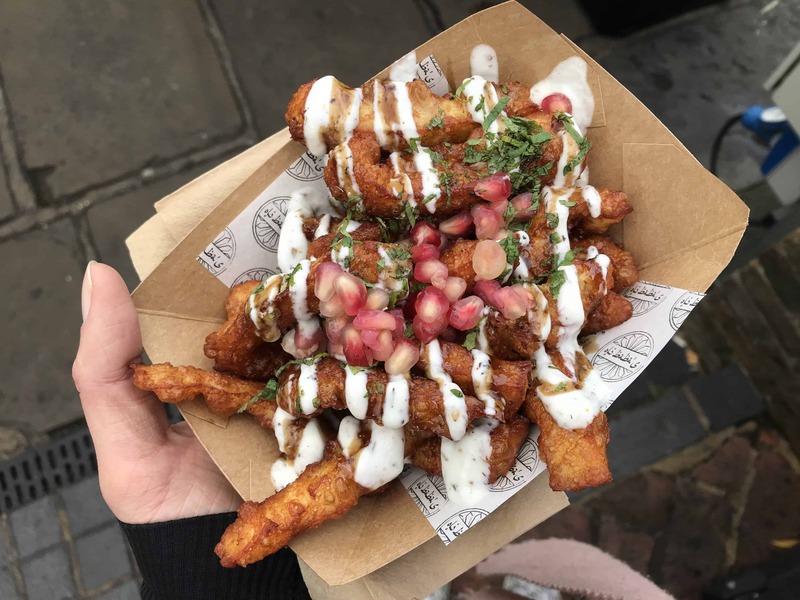 I spent MONTHS dreaming about these halloumi fries before I finally tracked them down at Kerb Food Market in Camden. Crispy, salty cheese topped with pomegranate molasses, fresh mint, yoghurt and pomegranate seeds. They are so delicious and great to grab on-the-go. 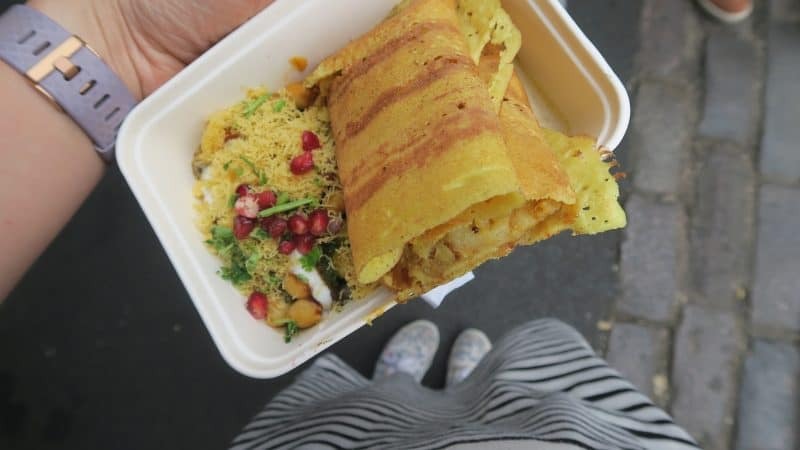 Make sure you check out my guide to gluten free Kerb in Camden here for more inspiration if you’re in the area! The Good Life Eatery is another place with a ‘healthy’ vibe to it. Lauren and I visited when we stayed in London a couple of years ago, and it was right opposite our Air BnB! I love the vibe of this place, and it has an interesting menu with gluten free options, including gluten free bread. It also has a selection of smoothies as well as some raw treats. 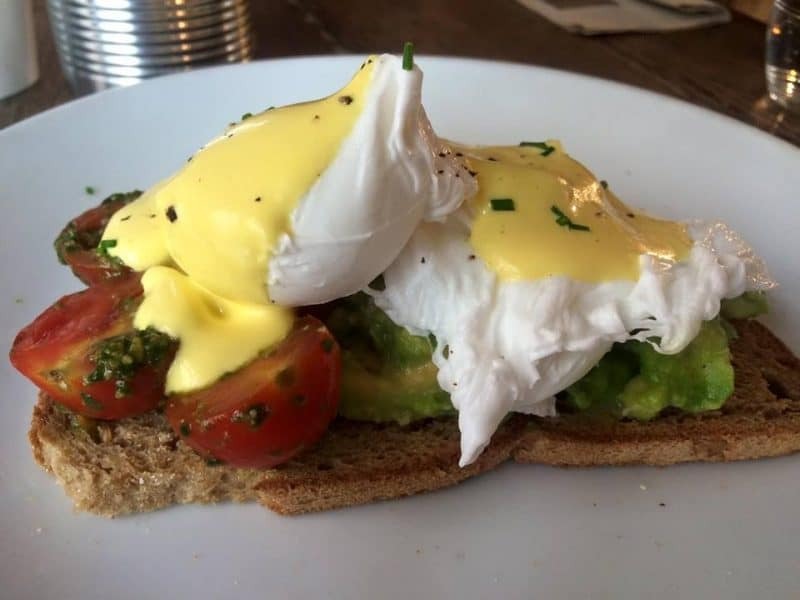 I visited The Bach for the first time recently for brunch with the lovely Laura at My Gluten Free Guide. They have such an extensive gluten free menu and are really clued up on coeliac disease and cross contamination too. From gluten free bread to gluten free pancakes, they are THE place to visit and I can thoroughly recommend them. Plus the decor is amazing and reminds me of being home near the beach! 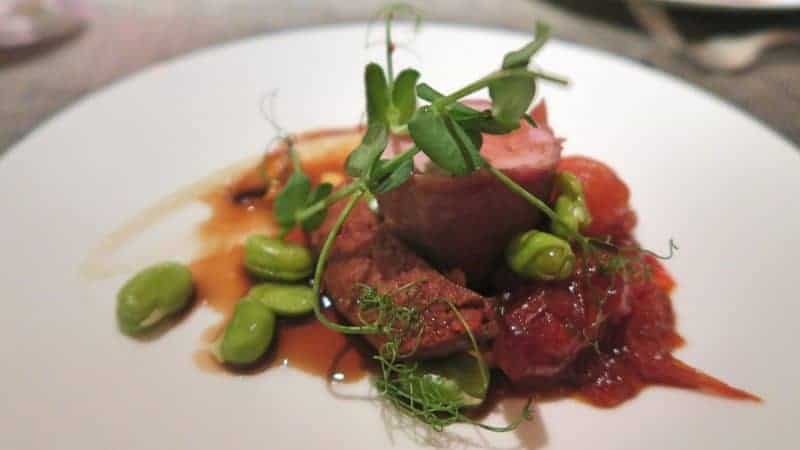 Indigo Restaurant at One Aldwych Hotel, Covent Garden, is a gluten free haven. The menu is approved by Coeliac UK and there is so much choice! When I stayed there I tried the taster menu and it was incredible, but I’ve heard talk of all sorts of goodies, including gluten free fish and chips. Oh, and they do the BEST gluten free white chocolate and raspberry muffins ever – check out my full review here. I don’t even know where to start with Broadway Market! 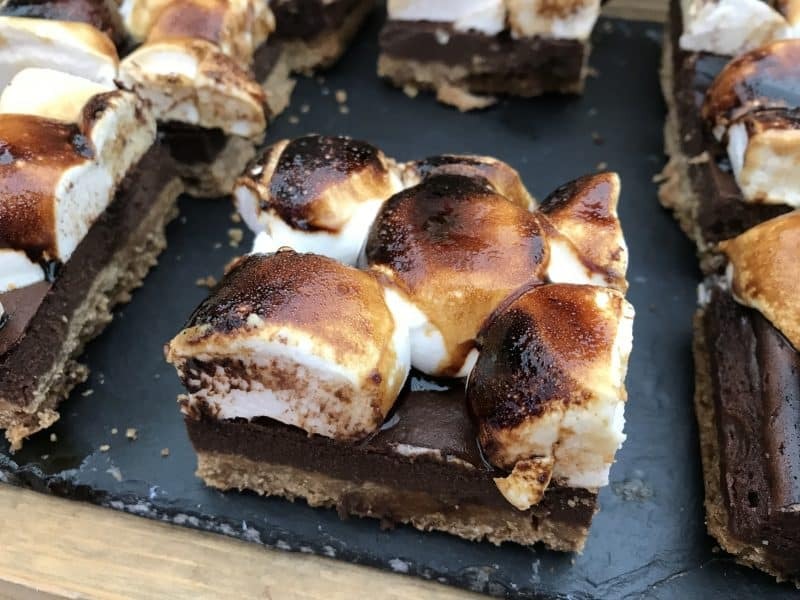 It’s an absolutely playground for coeliacs – from gluten free doughnuts to gluten free s’mores cheesecake brownies (I know!) there are so many different stands that are coeliac friendly. 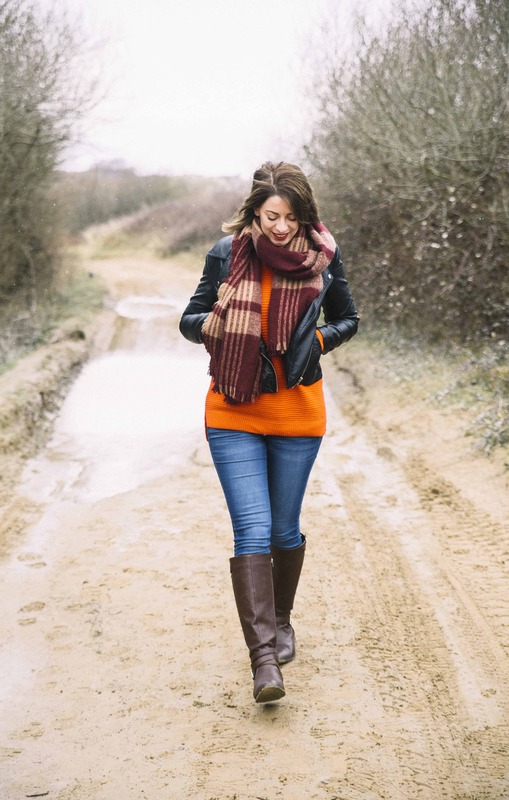 I managed to find scotch eggs, pancakes and much more – just spend an afternoon wandering! 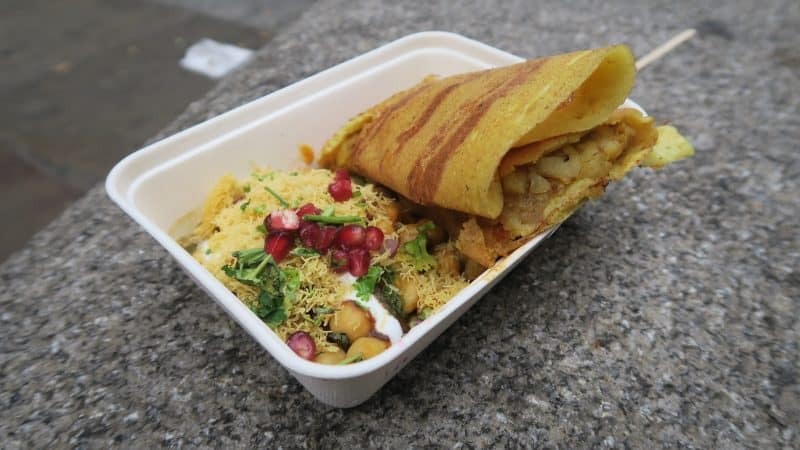 Gluten free London – what are your recommendations? With some more visits to London on the cards, I’d love to know if there are any places I MUST visit in London which do gluten free food. I’m thinking of putting together a Gluten Free London Bucket List for my next trip(s)! Comment below with your suggestions on exploring gluten free London, or on my Facebook Twitter and Instagram pages! Do you know about Vitao? https://vitao.co.uk/ Being going for quite a while now. Really unusually delicious with an pan Asian spin. And vegan. On Oxford Street, right by Tottenham Court Road tube. I think I’ve actually popped into here before, and got an almond milk latte. The food looked good but wasn’t looking to eat at the time – will have to give it a go! Hey love this guide! Thanks for putting it together. Honest Burger is one of my all time favourites. I love fresh Vietnamese – the chain called Pho (but apparently menu has changed recently and I haven’t been since..) and ‘Pho and Bun’ in Soho. Both brilliant with loads of gluten free options. Worth checking out next time you’re up! I REALLY want to go to Pho! I hear so much about it but haven’t been yet – it’s a MUST for next time! So let me pitch to you just *one* new place to try. You will love it. I know this because you already love Leon and it is basically Leon but way, waaay better. Seriously. Think Beth and I need to go back to London….I’ll get this girl eating more variety if it kills me!!! Restaurant called Indigo which is in the 1Aldwych hotel off the Strand. In the upper price bracket but superb food and EVERYTHING on the menu is Gluten Free! So no questioning ‘is it GF or can it be made GF’ – it all is! My husband is a Coeliac and loves it. Wow, that sounds like heaven!! Will have to try that! Love this, so many good places to eat! I’d also recommend Herman ze German which is on the same road as Leggero (also amazing) in Soho. Amazing if you like German sausage and chips. Sadly the currywurst isn’t gluten free but the sauerkraut is delish! Great list, I’ll be heading to some of these. Niche in angel is completely gluten free and many vegan options. Completely delicious….especially the southern fried chicken!! Pho is a fantastic place for GF foods ! Wish I had seen this before I went to London at begining of year. Apart from Leon’s I found it really hard to get safe gluten free food ended up really not well after one meal that I was assured was gluten free. And there were a few other times I was told things were gr but the cramps told me otherwise. Also was shocked at the amount off place that didn’t cater at all for gf not one thing on menu. Will be going to London in the next couple of months as my daughter will be staying in hospital for some specialist treatment so I will see if any of these places are near her hospital and my Hotel. Always enjoy reading your blog. I’m wheat intolerant so going for the g/f options means I’m safe too. By the by, I recently went to a Chinese/Malaysian restaurant in Ilfracombe, Devon, called Emperors Court and loads of g/f options. They were so helpful too when it came to choosing what I could and couldn’t eat.